As a wrestling fan, I can't believe I've never had a wrestling themed birthday party. Of course when I was a kid and still doing birthday parties, the marketing genius that is the WWF wasn't established yet. So when I recently turned 39, my friends and colleagues with All American Pro Wrestling made that wish come true. The taping for the season 2 premiere of AAPW Collision happened to fall on my birthday. The front office staff and other volunteers arrived at the arena early that morning for set up. By 1 p.m. we were able to take a quick lunch break and marketing director and Ring Posts blogger Adam Testa treated me to lunch at O'Charley's. It was a nice surprise. Of course on Facebook, the birthday wishes came flooding in too. One friend from high school, Brian, included a video on my Facebook wall of the Rock singing happy birthday to Stephanie McMahon. Even though I'm currently #TeamCena, the video made me smile. Another Facebook friend and fellow wrestling fan, Buffblogger, included a picture of the coolest birthday cake I think I've ever seen. 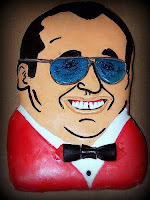 It's the late, great Gorilla Monsoon. That too added to the enjoyment of my day. Back to the Collision taping, as the wrestlers started arriving I was greeted with hand shakes, hugs, and happy birthday wishes. Adam and I made the rounds making sure promos were getting taped and head shots were being taken. Then it was finally showtime. Executive producer Chris Hagstrom did his usual "pump up the crowd" pre show talk and introduced me. I made my way around the ring slapping hands with the fans as they also wished me a happy birthday. 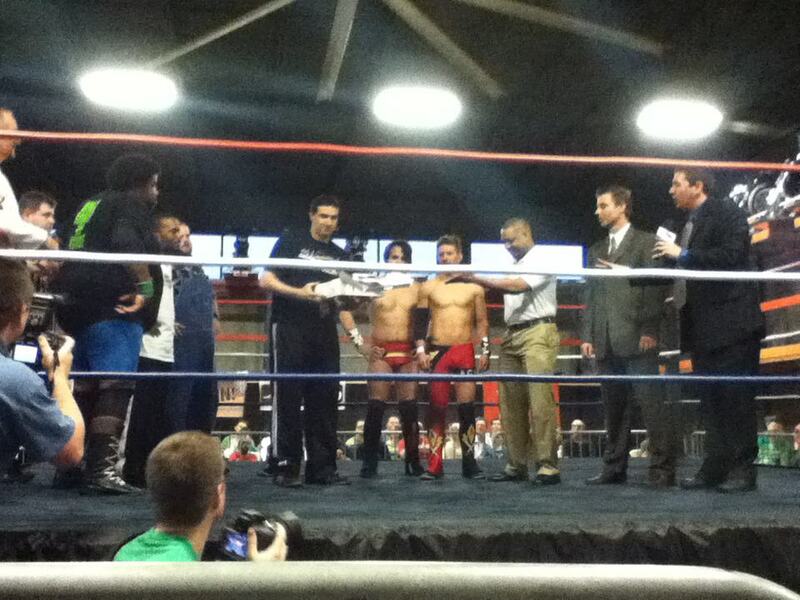 I went to sit down at the commentary table, when Chris called me into the ring. He informed the crowd that it was my birthday and then called a group of the wrestlers and other staff members out from the locker room. Head of security Aaron Heller (the Wrestling Roommate), presented me with an AAPW birthday cake as everyone sang happy birthday to me. Happy birthday to me. Thanks guys! It was such an expected surprise. I appreciate all the thought that went into making my day a little more special. Getting to spend the day doing what I love was one thing, but then to have everyone recognize it and celebrate with me made it that much better. I left my house at 7:45 a.m. and got home just after 1 a.m. the next morning. I was greeted with handmade birthday cards from my kids, $5 in cash, and a homemade birthday cake that we ate for breakfast. Yes, I'm 39 now and heading for 40. Some might suggest it's time to grow up, but I don't think I'll be doing that anytime soon. I'm having the time of my life with AAPW, My 1-2-3 Cents, and the upcoming From the Rafters Radio show we're launching on March 29th. Thanks again to the fans, friends, and family who wished me a happy birthday. You guys are the greatest.